Former Gor Mahia goal poacher Baldin Ngwa is back in Kenya after a season out of the club in North Africa.Ngwa arrived in the country earlier on Wednesday morning and attended the team’s training at the City stadium later in the day.Ngwa is also part of the final list presented by Gor Mahia to CAF for the Confederation of African soccer championship. Ngwa’s return will be seen as a great blessing to Gor Mahia who vividly remember his special goals and supplies in the 2010 season where he partnered with George Odhiambo ‘Blackberry’ to guide K’ogalo to a second spot finish behind Ulinzi Stars. At the same time Gor Mahia has also presented its final list of 33 players to take part in the 2012 CAF confederation Cup championship. Gor Mahia opted for a late registration of players that invites a 500 dollars’ fee since they had not finalized on their new signings. 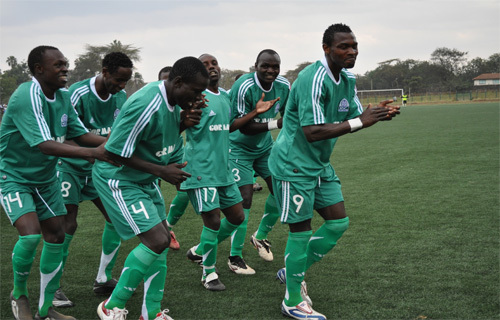 Ngwa will join the new signings at the club to eef up Gor Mahia's striking force in teh coming season.